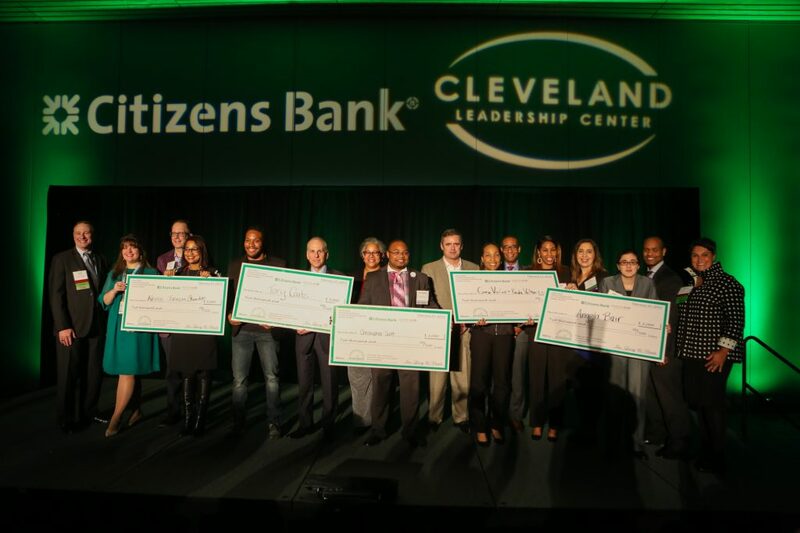 Tory Coats’ idea to help youth create pop-up shops in city neighborhoods was voted the winning civic pitch by the audience Wednesday night, February 21, at Accelerate: Citizens Make Change, an annual competition presented by Citizens Bank and Cleveland Leadership Center. Coats will receive $5,000 to help bring his civic vision to reality following a competition among ideas to accelerate Cleveland’s positive momentum. He said the Dare 2 Believe Young Entrepreneur Pop-up Shops will help prepare tomorrow’s business leaders today by offering them business experience and a place to sell products they create. His pitch was in the Economic and Workforce Development category presented in partnership with Oatey during the competition, which nearly 500 people attended in the Global Center for Health Innovation in downtown Cleveland. Nearly 80 pitches were submitted for this fourth annual Accelerate event. From those, 25 presenters were selected, with five in each of five categories. Panels of judges selected one presenter in each category during smaller breakout sessions before the five finalists pitched to the full audience, which selected the winner by cell-phone voting. Keshia Johnson Chambers pitched about “This is BLK CLE” in the Community Change category presented in partnership with Oswald Companies and Westfield Insurance Foundation. She wants to create an internet and social media-based platform that supports and promotes the African-American community and those who are engaged in it or want to learn more about black culture in Cleveland. Christopher Scott pitched about “Speak for Me” in the Educating for Tomorrow category, presented in partnership with Nordson. He wants to create an app that connects schools and organizations in the African American community with a network of talented local speakers who can address motivational needs. Gina VanCant and Kendra Valton pitched about “Latch & Learn” in the Health & Wellness category presented in partnership with the Cleveland Clinic. They want to promote breastfeeding in the African American community through education, incentives, consultants and other resources that reduce infant mortality. Angela Bair pitched about “Special Needs Resource Library” in the Quality of Life category presented in partnership with Cuyahoga Community College and Thompson Hine LLP. She wants to create a library that has educational and therapeutic resources for parents and caregivers of special needs children as well as educators, students and professionals. Larry Oscar, CLC board co-chair and an event co-chair, said that all presenters, not just the five finalists, have new opportunities to implement their projects because the event helped them raise awareness and build connections. “Hundreds of civic leaders listened to the pitches and met the presenters, and even more can meet them online and after the event. Many of them will be inspired to help these ideas have an impact on the community,” said Oscar, a partner of Hahn Loeser & Parks LLP. Updates on the pitches will be posted on www.cleveleads.org, and on Facebook and Twitter (@cleveleads) using #accelerateNEO. Many presenters from previous Accelerate events have launched their projects, including the 2017 winner, Ironeborne Brew Works, a benevolent brew pub that gives back to the community and is scheduled to open this year. The 2016 winner was KinderKits, which is helping thousands of families across Ohio prepare their children for kindergarten. The 2015 winning pitch for Cleveland Codes has become a program that is training disadvantaged youth for careers in technology. Many other past presenters and finalists have put their projects in action and are improving life in Cleveland.